At a meeting of the Birmingham Trades Council on Thursday, November 1, at the Council Chambers in the Council House, Victoria Square, the meeting of delegates and observers to the Trades Council debated the war in Afghanistan and how to further its role. All of the delegates saw the crucial role of the labour movement in opposing the war. The delegates looked back to the role of the trade unions in history in opposing imperialist-inspired war and saw that it was imperative today to do the same and oppose the war activities of US imperialism and the British government. One observer said that the Longbridge workers, Rover workers, car workers in general need to fulfil their role in opposing the war. He pointed out that many collective groups had taken up the cause of fighting against the war and that it is imperative that the working class takes up its leading role in the forefront of the movement. The speaker received loud applause. Bill Golding, ex-area official and key trade union organiser for the MSF, spoke out against the war and also supported the struggle of the Palestinian people for a homeland. He said that there were those who wanted to make fundamentalism the issue rather than highlight the key role of United States imperialism with its strategic ambitions in the war. He supported the aims of the anti-war coalition and urged that the movement should move forward on this basis. His speech was greeted with support from the Trades Council meeting. Trades Council delegates said that they would support the anti-war meeting being organised in Frankley on Sunday. (a) To organise a coach to the national demonstration on November 18th, with the aim of maximising the turnout from the Trade Unions. (b) To affiliate to the National Stop the War Coalition. (d) Circulate (by letter, phone, e-mail) trade union branch secretaries asking for support for the above activities and for other initiatives organised by the Birmingham Stop the War Coalition. The Trades Council has already been playing and important role in supporting the Birmingham Anti-War Coalition and printing leaflets free of charge, etc. The Trades Council is going to organise a major local demonstration against the war, which is going to march from Small Heath Park, Birmingham. 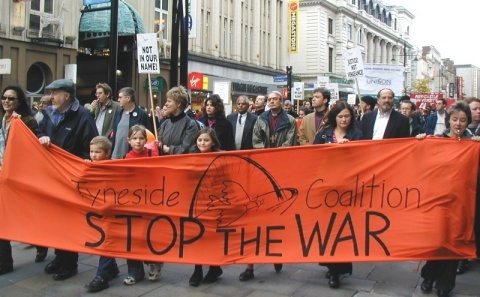 A successful anti-war march and rally was organised in Newcastle by the Tyneside Stop The War Coalition on Saturday, November 3. Over 600 people marched through Newcastle upon Tyne, calling for an end to the bombing of Afghanistan. The crowd heard eight speakers from a diversity of groups, united in their condemnation of the terrorist attacks of September 11, and their call for the violent retaliation against Afghanistan to end. The march moved off from the Civic Centre behind a large banner Tyneside Coalition - Stop the War, on its way to the Grey's Monument in the centre of Newcastle. 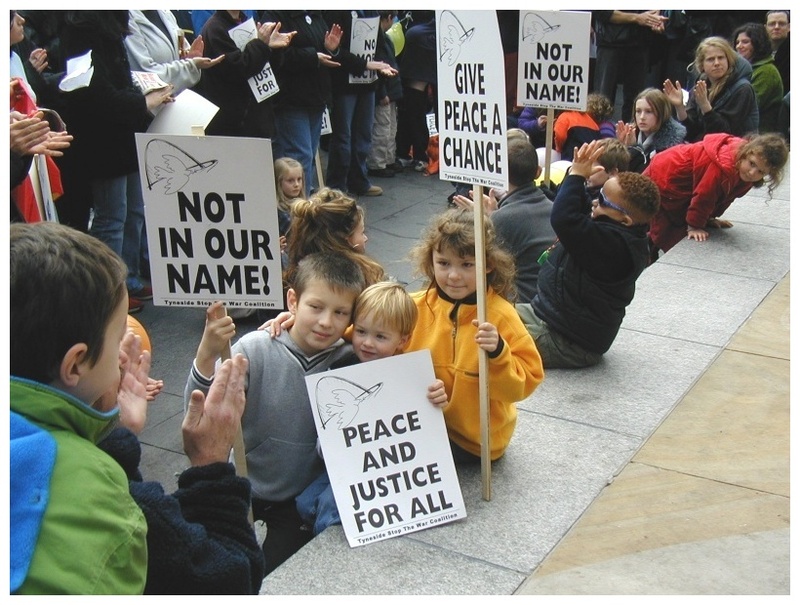 Hundreds of placards with the slogans, Not In Our Name!, Peace and Justice for All!, No More Victims!, Give Peace a Chance! Health Workers Against the War! Millions Will Starve This Winter! were held up by the demonstrators as it passed down Northumberland Street accompanied by the sound of the drums of a Samba Band at the head of the march. Hundreds of leaflets were given out along the way and many people joined in swelling the demonstration to around a thousand by the time it reached the Monument. The speeches at Grey's Monument began with a powerful plea by Rabbi Moshe Yehudai-Rimmer for the bombing to stop and innocent victims to be spared, ending with a prayer in English and Hebrew. He was followed by Alan Smithson (Bishop of Jarrow), Kevin Flynn (Tyneside Socialist Alliance), Rasheed Saraba (Pakistan Labour Party) and Sylvia Boyes (CND and Trident Ploughshares), as well as Farrah Kahn and Russell Gasser. Tina Downes, national President of the NATFHE lecturers' union, spoke of the need for a rational response, looking for the causes of the terror attacks and not for violent retaliation, and messages of support were read from MPs and the Deputy Mayor, John Marshall. Alice Mahon, MP, sent a statement calling for the bombing to stop to allow in food aid, saying "The war is producing more innocent victims, and is not a just response." Several of the speakers condemned the horrific use of cluster bombs during the last week. Farrah Kahn, a freelance journalist, compared them to air-borne landmines, describing how she had met toddlers maimed by the unexploded yellow bomblets. Russell Gasser, who worked two years ago with landmine clearance groups in Afghanistan, spoke of "cluster bombs" and "carpet bombs" as two of the worst phrases in the English language, describing their hugely indiscriminate nature (a large proportion, or even all, of the bombs dropped, from 5-6 miles up, will miss their target), and their high failure rate (10-30% of the bomblets fail to explode). Every field in Laos is now unsafe for local farmers, because of unexploded munitions left behind after "carpet bombing" by US planes during the Vietnam war. Concluding the rally Sam Robson, who chaired the proceedings on behalf of the Tyneside Stop the War Coalition, said that the demonstration and rally had been a magnificent achievement and had put down a marker in the north east that we will not tolerate this war being carried out in our name. He said that the Stop the War Coalition condemned the innocent deaths in New York and equally condemned the deaths of innocent people in Afghanistan. "We are part of an international movement against the war, and the movement is growing." he concluded. "The march was bigger than we had even hoped, and its diversity demonstrated the breadth and depth of feeling against the war," said Andrew Gray, from the local coalition group that had organised the protest. "The response of the US and UK this last week has been to escalate the violence and resort to carpet bombing. The military response is not just politically foolish but profoundly wicked." The coalition later held its seventh weekly vigil for peace, and has organised two coaches for the national demonstration in London on November 18. 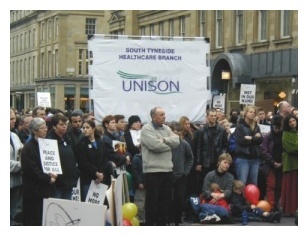 Tina Downes, National President of NATFHE, said that this was not a one off demonstration. She pointed out that the demonstration on October 13 had 50,000 people on it and that the next one in London was going to be even bigger. This is a big movement, she said, and it is growing all the time. She pointed out that the NATFHE National Executive Committee had unanimously voted against the war and for having an anti-war statement on their website. Explaining the stand of the union, she said that teachers do not vote for war. They want people to think. Continuing this theme, she said that teachers want people to be informed and to discuss, have rational reasons for doing things and be open minded to the views of others. She emphasised that teachers do not believe in hitting back in blind revenge. She pointed out that NATFHE has members across many cultures and religions including Islam. She said that they also teach students from all over the world and many teachers may face in the class room the potential conflicts that are being stoked by the government and the media at the moment. Such a war can only be bad for us, she said. She pointed out that the reason the attack on America was horrific was that unsuspecting innocent civilians were killed for the sake of a political aim. And what has been the response? It has been a revenge attack on a foreign government, which involves the killing of innocent civilians for political reasons. This is hypocrisy by the US and British governments. Tina Downes said that teachers want to know the reasons for things: why do extremist groups develop what drives them to violence and terrible acts? She declared that the rich world exploits the poor world consistently in the name of trade and profits. She said the rich take advantage of the poor world and call it uncivilised and the transnational companies and governments are complicit in this and globalisation and privatisation are all part of the same picture. She said that whilst they are doing this they are also depressing wages in this country. She added that when refugees, or immigrants come here from these exploited countries, they experience personal and institutional racism and that is the first feeling of exclusion. She continued on the reasons behind the war by saying that there are massive US interests in running an oil pipe line across Afghanistan to exploit the Asian market. That is why they want to get rid of the Taleban, she said. She said that this "war against terrorism" is very convenient, and it makes the destruction of one of the poorest countries in the world desirable to the US. She said that there is no benefit to working people and their trade unions to destroy other workers and their countrys infrastructure. Such a thing is only of benefit to rich countries and rich people. She emphasised that the destruction of aid will cause 600,000 deaths. The NATFHE President concluded her remarks by saying that we must make our voices heard by the government and be in solidarity with the people of Afghanistan. This war is political and commercial. It is not in our name! Twenty protesters barricaded themselves in a Royal Navy Office at the University of Sussex on Friday, November 2, taking a Royal Navy officer hostage in the process. Outside, 200 students also threatened to storm the campus building at Falmer, near Brighton. Police negotiators spoke with the group inside the university, who emerged at 2.15pm. In total, 20 people have been arrested on suspicion of false imprisonment and criminal damage. Chief Inspector Kul Verma said: "People are entitled to protest so long as they do so peacefully and lawfully. Today's actions weren't lawful and the police response has been robust and appropriate." More than 2,000 people joined an anti-war march and rally in the centre of Dublin on Saturday, November 3. The demonstration was organised as a protest against US-led bombing in Afghanistan. Among those at the event were former cabinet minister Michael D Higgins, a senior member of the opposition Irish Labour Party, as well as Green and Socialist Party representatives. Rory Hearne, of the Irish Anti-War Movement, organisers of the rally, criticised the Irish government for failing to use its position on the UN Security Council to oppose the raids on Afghanistan. He also pointed out that the US-led aggression had as much to do with maintaining American influence in oil-rich regions as it did with fighting terrorism. According to the Iranian IRNA news agency, Iranian leader Akbar Hashemi Rafsanjani in Tehran on Saturday described the US-led strikes on Afghanistan as "unsuccessful, uncertain and futile" to solve any crisis, and said the US is not entitled to have the exclusive right to anti-terrorism campaigns. He stressed that the attacks on the war-ravaged country would lead to worsening of the crisis as well as growing insecurity and instability. He pointed to the international consensus on the need to launch an all-out fight against terrorism, and called on the United Nations to supervise co-ordinated efforts in uprooting terrorism at the global level. Rafsanjani pointed to Iraels misuse of the current crisis in Afghanistan to curb Palestinians, and called for the destiny of Palestinians to be determined. These rulings are closely related to Islam and the acts that corrupt a person's Islam. The polls showed that the vast majority of the sons of the Islamic world were happy about these strikes because they believe that the strikes were in reaction to the huge criminality practised by Israel and the United States in Palestine and other Muslim countries. This clearly indicates the nature of this war. This war is fundamentally religious. The people of the East are Muslims. They sympathised with Muslims against the people of the West, who are the crusaders. This fact is proven in the book of God Almighty and in the teachings of our messenger, may God's peace and blessings be upon him. We should also renounce the atheists and infidels. It suffices me to seek God's help against them. Rather, they moved for the sake of their religion. This is because they know that they are right and that they resist the most ferocious, serious, and violent Crusade campaign against Islam ever since the message was revealed to Muhammad, may God's peace and blessings be upon. After this has become clear, the Muslim must know and learn where he is standing vis-à-vis this war. After the US politicians spoke and after the US newspapers and television channels became full of clear crusading hatred in this campaign that aims at mobilising the West against Islam and Muslims, Bush left no room for doubts or the opinions of journalists, but he openly and clearly said that this war is a crusader war. He said this before the whole world to emphasise this fact. But when the victim starts to take revenge for those innocent children in Palestine, Iraq, southern Sudan, Somalia, Kashmir and the Philippines, the rulers' ulema (Islamic leaders) and the hypocrites come to defend the clear blasphemy. It suffices me to seek God's help against them. The common people have understood the issue, but there are those who continue to flatter those who colluded with the unbelievers to anaesthetised the Islamic nation to prevent it from carrying out the duty of jihad so that the word of God will be above all words. Anyone who lines up behind Bush in this campaign has committed one of the 10 actions that sully one's Islam. Following World War I, which ended more than 83 years ago, the whole Islamic world fell under the crusader banner - under the British, French and Italian governments. For several years our brothers have been killed, our women have been raped, and our children have been massacred in the safe havens of the United Nations and with its knowledge and co-operation. Those who claim that they are the leaders of the Arabs and continue to appeal to the United Nations have disavowed what was revealed to Prophet Muhammad, God's peace and blessings be upon him. Those who refer things to the international legitimacy have disavowed the legitimacy of the Holy Book and the tradition of Prophet Muhammad, God's peace and blessings be upon him. Those who distinguish between America and Israel are the real enemies of the nation. They are traitors who betrayed God and His prophet, and who betrayed their nation and the trust placed in them. They anaesthetise the nation. Every Muslim must stand under the banner of There is no God but Allah and Muhammad is God's Prophet. I remind you of what our Prophet, may God's peace and blessings upon him, told Ibn Abbas, may God be pleased with him. And if they assemble to harm you, they will only harm you with something that God has already preordained for you. God wrote man's fate and it will never change. God bear witness that I have conveyed the message. God bear witness that I have conveyed the message. God bear witness that I have conveyed the message. God's peace and blessings be upon you.